The site has been set for the Nov. 8 light heavyweight title-unification fight between Bernard Hopkins and Sergey Kovalev, and the winner is Boardwalk Hall in Atlantic City, Golden Boy Promotions has announced. Ageless wonder Hopkins, 49, of Philadelphia, holds two of the four major belts. Kovalev, of Russia, has one. Their bout – staged by Golden Boy Promotions along with Main Events Inc. – will be televised by HBO. Hopkins is 55-6-2 with 32 knockouts. He has not had a knockout victory in 10 years, or since he stopped Oscar De La Hoya in the ninth round in September 2004 in Las Vegas. Kovalev, on the other hand, has been a wrecking machine. He is 25-0-1 with 23 knockouts. He has six first-round knockouts, 10 in the second round. Welterweight champion Manny Pacquiao and Chris Algieri on Monday will begin a six-city news conference tour promoting their welterweight title fight slated for Nov. 22 in Macau, China (on HBO pay-per-view. Pacquiao (56-5-2, 38 KOs), 35, most recently took back his championship belt from Timothy Bradley with a 12-round unanimous decision in April in Las Vegas. Algieri, of Huntington, N.Y., is 20-0 with eight knockouts. He got up from two first-round knockdowns to upset junior welterweight champiion Ruslan Provodnikov in June in Brooklyn. Algieri won a split-decision, though some thought Provodnikov deserved the victory. The news-conference tour will begin Monday in Macau, China and then Tuesday the site will be Shanghai. It will then shift to San Francisco on Aug. 29 and to Las Vegas on Aug. 30. Pacquiao will throw out the first pitch at Dodger Stadium on Sept. 1, and a Los Angeles news conference will take place two days later on Sept. 3. The final stop will be Sept. 4 in New York City. Promoter Dan Goossen, president of Goossen Tutor Promotions in Sherman Oaks, on Wednesday won yet another legal battle with super middleweight champion Andre Ward. Ward has been trying to free himself of his contract with Goossen, to no avail. Wednesday, L.A. Superior Court judge Holly Kendig ruled that Ward had not stated any basis for which the contract should be invalidated. Ward has contended that his contract with Goossen violated Section 2588 of the California Labor Code, which basically says a personal services contract may not go longer than seven years; Ward has been with Goossen since December 2004, but signed a contract extension in 2011. Kendig also noted that Ward – in his attempt to break free from Goossen – has already been shot down twice by the California State Athletic Commission. It so happened that yours truly was at the Robert Garcia Boxing Academy in Oxnard on Tuesday to talk to Marcos Maidana, and ran into middleweight contender Marco Antonio Rubio. He was asked about the news that he will be challenging Gennady Golovkin for his world title on Oct. 18 at StubHub Center in Carson (on HBO). Specifically, we asked Rubio about taking on such a powerful puncher like Golovkin, who is 30-0 with 27 knockouts. That’s a knockout ratio of 90 percent. Rubio is 59-6-1 with 51 knockouts. He has knocked out 77.2 percent of his opponents. Rubio has twice fought for middleweight world titles. He was stopped after nine rounds by Kelly Pavlik in February 2009, and he lost a unanimous decision to Julio Cesar Chavez Jr. in February 2012. He is 6-0 with five knockouts since then. Heavyweight prospect Dominic Breazeale of Alhambra on Saturday ran his record to 12-0 with 11 knockouts when he knocked out Billy Zumbrun (27-13-1) at 2:05 of the second round Saturday in a preliminary bout at StubHub Center in Carson. Breazeale, a 2012 U.S. Olympian, decked Zumbrun twice in the first round. Breazeale is 28. Zumbrun, of Ogden, Utah, is 41. Friday’s weigh-in for Saturday’s Golden Boy Promotions card featuring Shawn Porter defending his welterweight title against Kell Brook at StubHub Center in Carson (on Showtime) will be open to the public. It will begin at 1 p.m. at the Northwest tennis pad at StubHub. Porter, of Akron, Ohio, is one of the more exciting new rising stars in the game. He is 24-0-1 with 15 knockouts and will be looking to make his second successful defense. Porter is just 26. Brook, of England, is 28. He is 32-0 with 22 knockouts. But he has his work cut out for him against Porter, a vicious seek-and-destroy fighter. Heavyweight contender Deontay Wilder (31-0, 31 KOs) will take on journeyman Jason Gavern (25-16-4, 11 KOs) in somewhat of a stay-busy fight Saturday at StubHub Center on the undercard of the welterweight title fight between champion Shawn Porter and Kell Brook (on Showtime). Wilder was asked recently about his training camp habits, and it was somewhat surprising to hear what kind of music the 28-year-old from Tuscaloosa, Ala. listens to while he’s working. “We hit the bags for a couple of rounds and listen to some old-school funk while we get warmed up,” he said. You just won’t find a lot of guys Wilder’s age who say they listen to old-school funk. That’s more along the lines of something yours truly would listen to, and I’m 57. Former world champion Adrien “The Problem” Broner of Cincinnati will fight at home for the first time in over two years when he takes on Emmanuel Taylor in the super lightweight main event on Sept. 6 at U.S. Bank Arena in Cincinnati (on Showtime). Broner last fought at that same venue in July 2012 when he defended his junior lightweight title against Vicente Escobedo via 5th-round TKO. Broner, 25, is 28-1 with 22 knockouts. He has won titles at junior lightweight, lightweight and welterweight. Taylor, of Edgewood Arsenal, Md., is 23. He has a record of 18-2 with 12 knockouts. 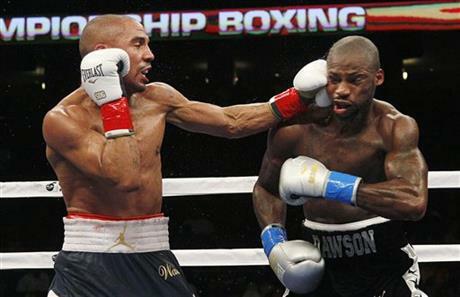 He has victories over Victor Manuel Cayo and Karim Mayfield. Bernard Hopkins is 49 and will be 50 on Jan. 15. Before that happens he’ll be facing yet another challenge in a long line of them. Although the actual date and site have yet to be determined, Hopkins will put his two light heavyweight championship belts on the line against hard-hitting Sergey “Krusher” Kovalev of Russia in a title-unification bout in November in either Atlantic City or New York City (on HBO). “Everything I do at this point in my career affects my legacy,” said Hopkins, who is 55-6-2 with 32 knockouts. “I’ve set and broken many records, but becoming the oldest undisputed light heavyweight world champion is the goal and Kovalev stands in the way of that goal. He’s another young, hungry fighter and just like the ones that came before him, he will leave the ring beltless. Hopkins is off just a bit in this statement. He will not be undisputed champion if he beats Kovalev. Hopkins has two of the four major belts, Kovalev has one. Adonis Stevenson has the other one, which means Hopkins would only have three of the four belts with a victory, and that would not quite make him undisputed champion. That said, Hopkins should be applauded for taking on a killer like Kovalev, who is 25-0-1 with 23 knockouts and is coming off a second-round TKO of Blake Caparello on Saturday in Atlantic City. Providing Sergey Kovalev successfully defends his light heavyweight title Saturday night against Blake Caparello at Revel Resort in Atlantic City (on HBO), Kovalev will next take on fellow champion Bernard Hopkins in a title-unification bout sometime in November in either Atlantic City or New York City, according to reports out of several outlets. Hopkins (55-6-2, 32 KOs) is 49 and will be 50 Jan. 15. The hard-hitting Kovalev (24-0-1, 22 KOs), of Russia, is 31.